Fair Isle Bird Observatory: the Warden's diary: Fog It. Fair Isle in easterly winds in the third week of May sounds like an ideal combination, but sadly the weather conspired to leave us in thick fog for most of the day, therefore rendering the island virtually invisible to migrants (and leaving any that had come in somewhat tricky to see). Sure enough, new birds were very limited, with a Wood Sandpiper on Da Water the highlight. A Common Scoter in South Harbour, 2 Red-breasted Mergansers, a few signs of common waders on the move and 3 Siskin were about the only other incontrovertibly new birds, although a Brambling on the West cliffs could well have been different to the single that has been lingering alone around the traps for the last ten days or so. Inevitably, the day list still had a healthy ring to it, with Caspian Stonechat and Western Subalpine Warbler (the male at Burkle) still present, and Cuckoo and Black Redstart were also lingering, but it was very much a feeling of what could have been. That feeling was further enhanced when those lucky enough to make it in on the Good Shepherd were treated to views of three Killer Whales on the way. The whales were seen fairly close to Sumburgh, so they occurred outside of Fair Isle waters and don’t make it into our ‘official records’, although I’m sure that nobody who saw them will care about that! 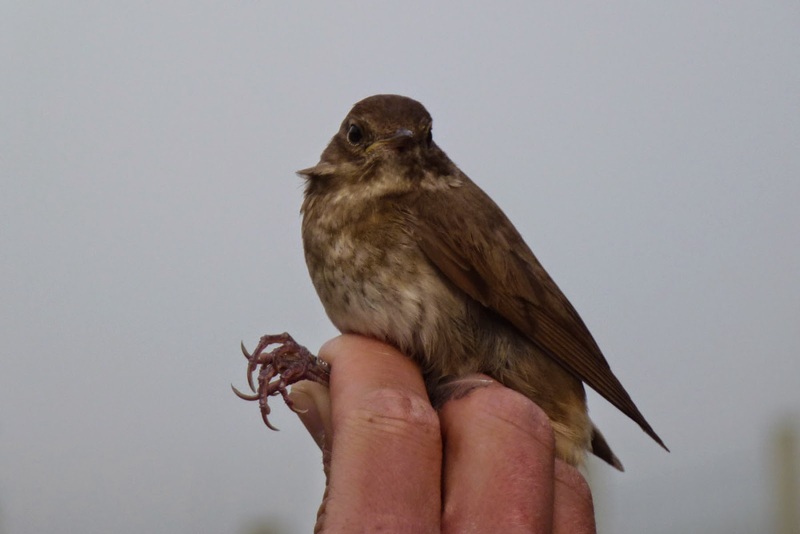 Blast from the past: this Thrush Nightingale was caught on a foggy 25th May in 2012 and was the second of the spring.